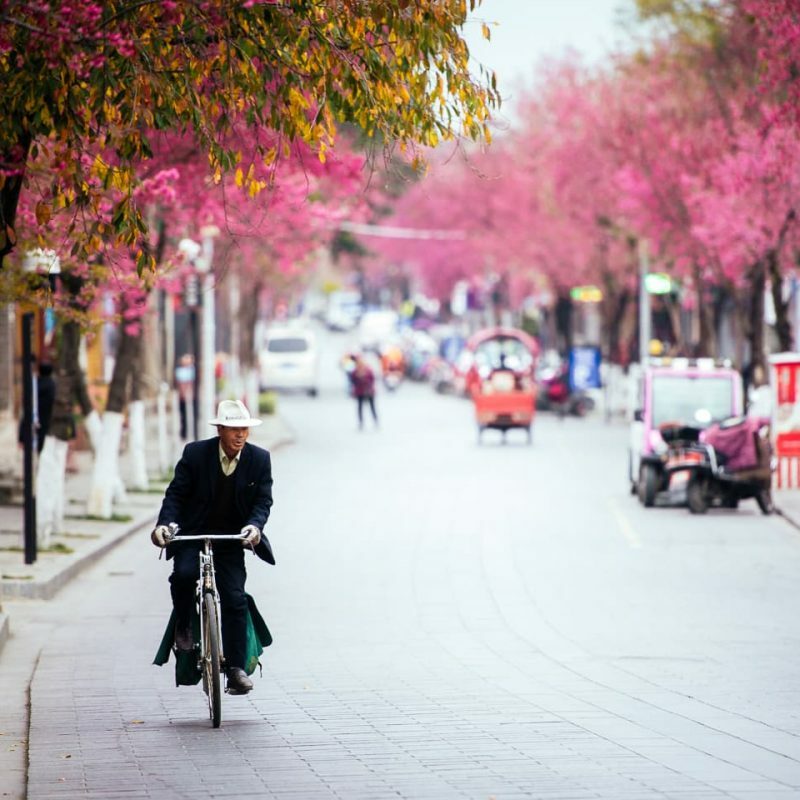 When we first arrived in Dali, China – right in the middle of the Spring cherry blossom season – we were only planning on staying for a couple of months before we moved on. But the relaxed culture and amazing scenery convinced us to make it our home for a year. There are many reasons we’re glad we changed our minds, but 8 months we discovered another. Dali has a Winter cherry blossom season as well. Spring cherry blossoms in Dali, China. 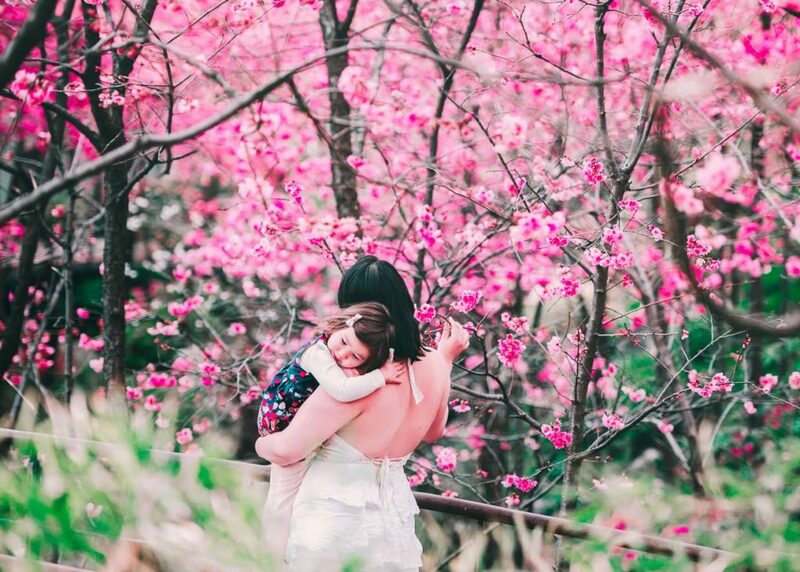 Last Spring we shared our photos from two of the best places to view Cherry Blossoms in Dali, China; The Cherry Blossom Valley, and the campus of Dali University. You can also see them scattered throughout the Old Town, and lining some of the more scenic streets, but for a truly dense landscape of pink flowers those are the places to hit. Check out those articles for directions to the best views. This Spring, since we are still in Dali, we get to enjoy them again. 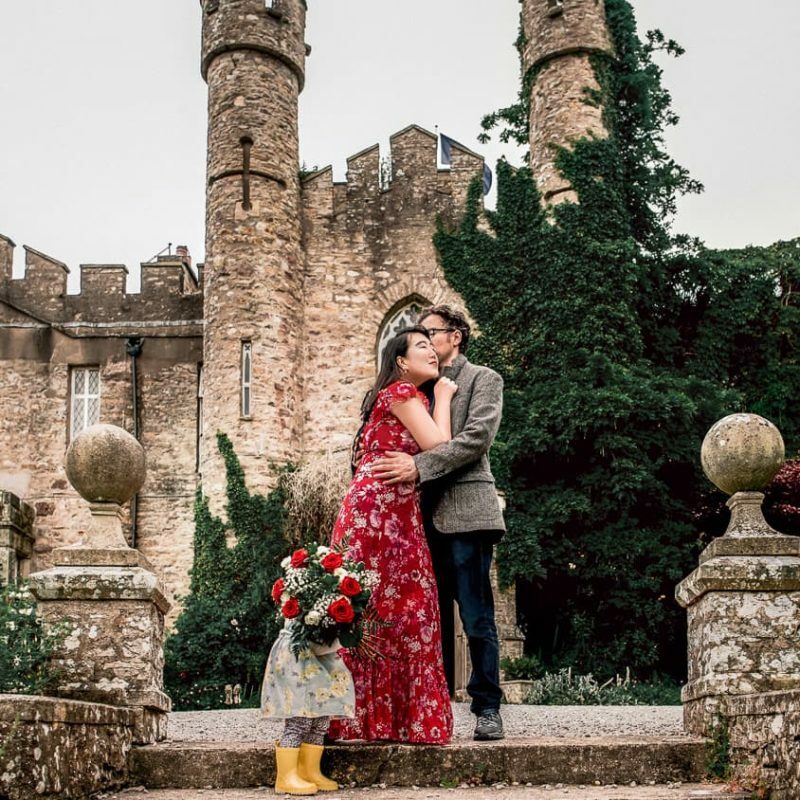 We already have a lot of photos of the flowers, so we decided to take a more relaxed approach. 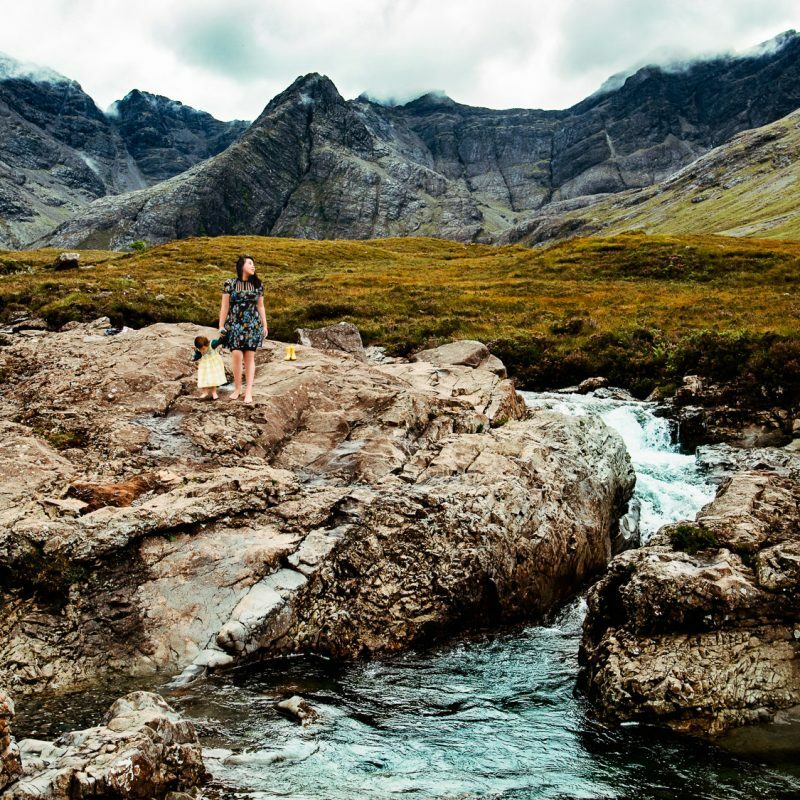 Our daughter, Lisa, is a year older and far more engaged with her environment than she was last year. Instead of taking her out for photo shoots, we thought she’d like to spend more time playing and enjoying the natural spectacle. 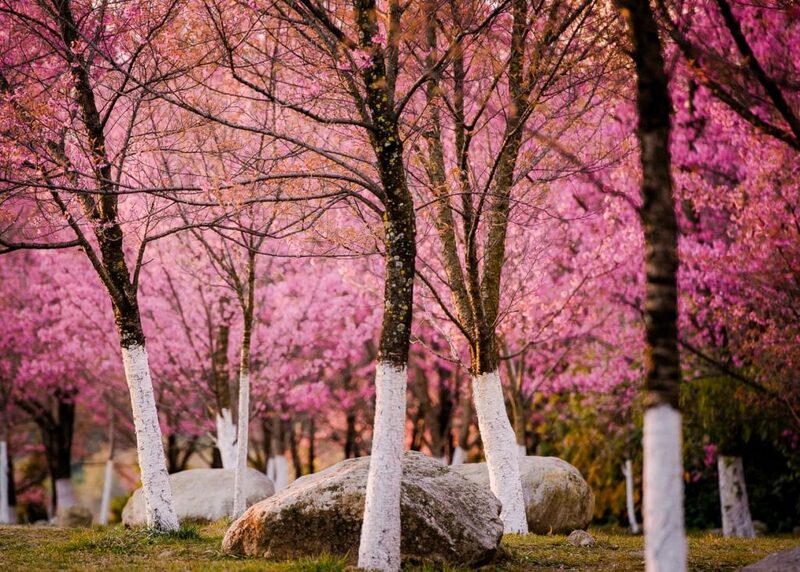 When is the Spring Cherry Blossom Season in Dali, China? In 2018, the spring cherry Blossom season started in early March, hit it’s peak in the middle of the month and was pretty much wrapped up by April. In 2019, the Winter was much colder, and everything was a bit later. The blossoms didn’t hit their peak until around April first. It’s now the 10th and there are still quite a few flowers on the trees. It looks like it will be over in about a week. While the flower’s are going it’s one of the most amazing natural displays your likely to see. The only thing comparable we’ve photographed was the lavender season in the fields of Provence, France. 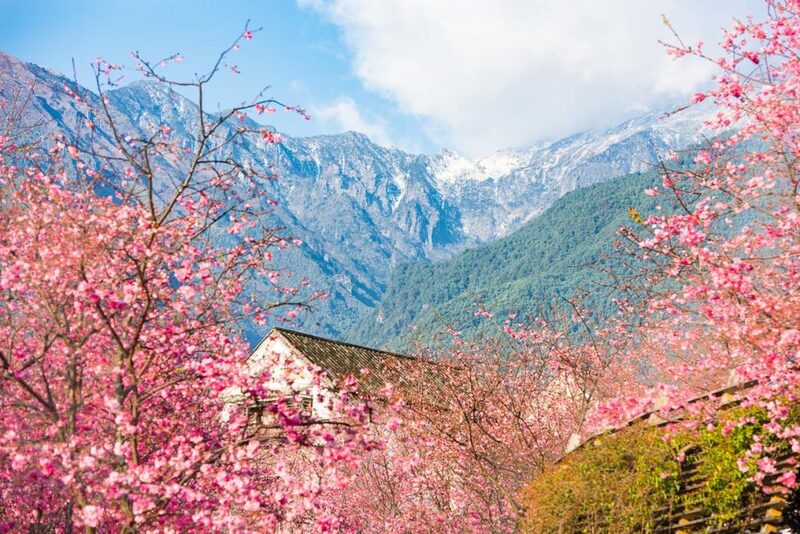 Cherry blossoms in front of the Changshan Mountains in Dali, China. 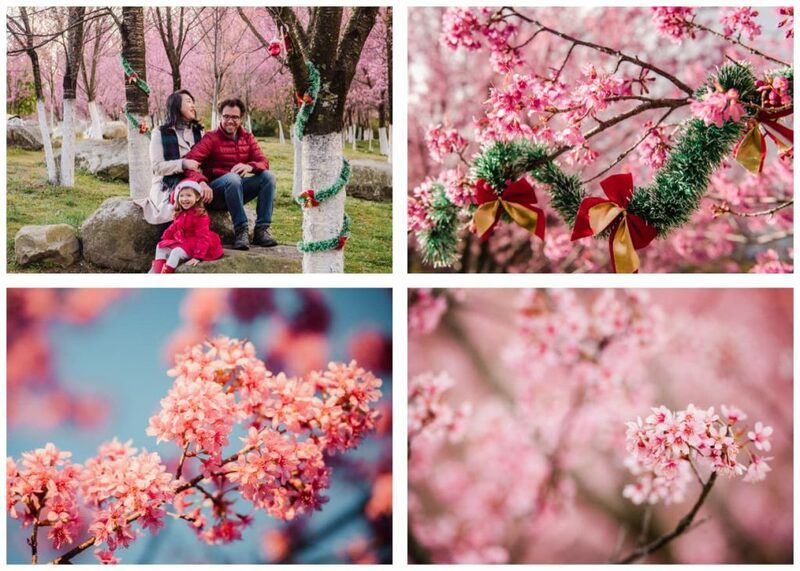 We didn’t know Dali, China had a Winter cherry blossom season until it started happening all around us. 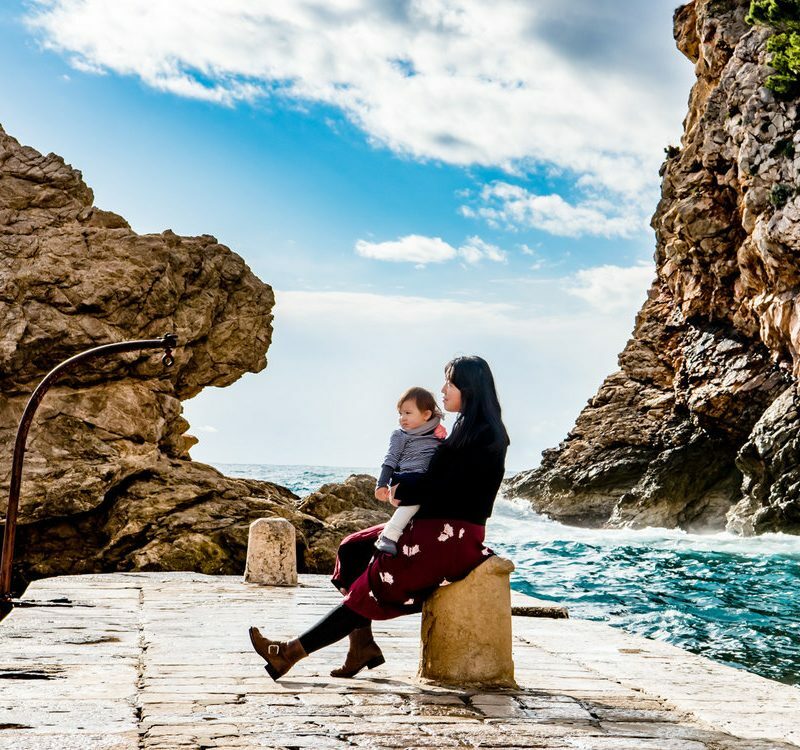 It never really hits the same intensity as the Spring season – the different seasons seem to correspond to similar but slightly different types of tree and the Spring variety has been planted in more places – but there are a few places where you can still get some great views. The highest density of Winter cherry blossom we found was back up at Dali University. To find them, you just have to head to the front of the university campus (Google Maps), and instead of walking up the steps toward the sculpture, turn south and walk up the inclined road just inside the gate. It will take you to a hillside on the left that is covered with flowering trees. Note that in order to use the Google Maps links while you are in China, you will need to have a VPN on your device since Google products are blocked in China. Winter cherry blossoms at Dali University. When we visited this site during the middle of the day there were lots of tourists and university students walking around pointing their phones up at the branches, but early in the morning we had the hill to ourselves and we got some nice scenery photos without the crowds. We even decided to take some Christmas photos under the branches, just because we thought the contrast of the exotic pink trees and the sparkling green streamers was kind of fun. It was cute, but our favorite Christmas photos are still the more candid ones we took when we weren’t posing, but actually celebrating in more authentic Dali fashion. Another great location is the South Gate of Bo’ai Road (Google Maps). Note that this is different from the main South Gate of the Old Town (Google Maps). It is surrounded by a dozen or so trees, and though it’s not as many as the fifty-plus you’ll see on that hill at Dali University, the gate as the backdrop more than makes up for it. You can then continue down Bo’ai Road where the sidewalks are lined with more trees. As you explore the old town you’ll see more as well. 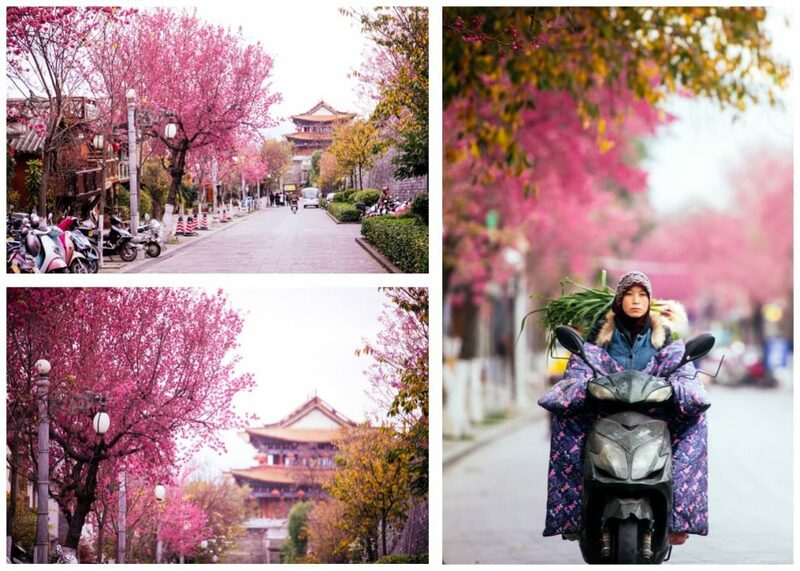 Winter cherry blossoms in the Dali, China Old Town. When is Winter Cherry Blossom Season in Dali, China? 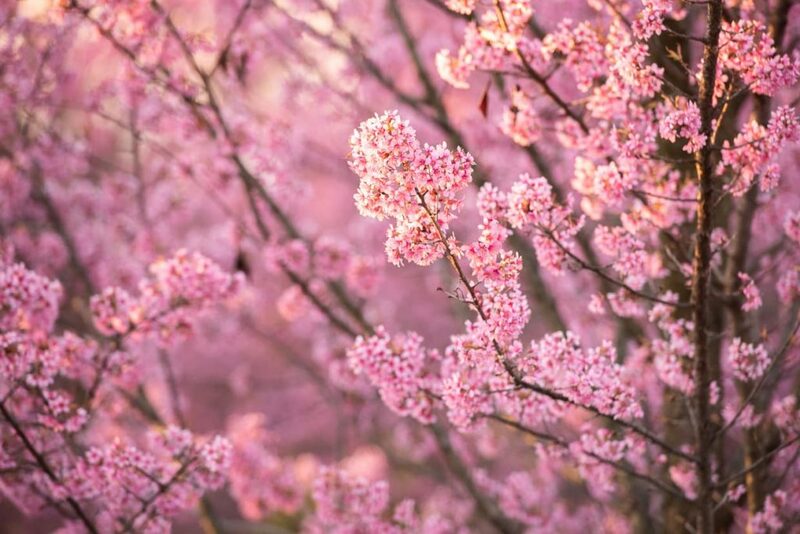 It is going to vary based on the weather, just like the Spring season did, but in 2018, the cherry blossom trees started flowering in mid December. It didn’t all happen at once though. Counterintuitively, the higher elevation trees seemed to open up first, with the ones in the Old Town being the last to drop their petals almost a month later. Our best recommendation is to arrive sometime in the December-January range and do a little exploring. If you celebrate the holiday season in Dali, you will most likely get some good scenery. If you are looking forward to taking photos of cherry blossoms during your trip to Dali, but you don’t feel like you know your camera well enough, you might consider checking out my e-book, Easy Manual Mode Photography, which is a math-free, jargon-free guide to taking creative control of your images. 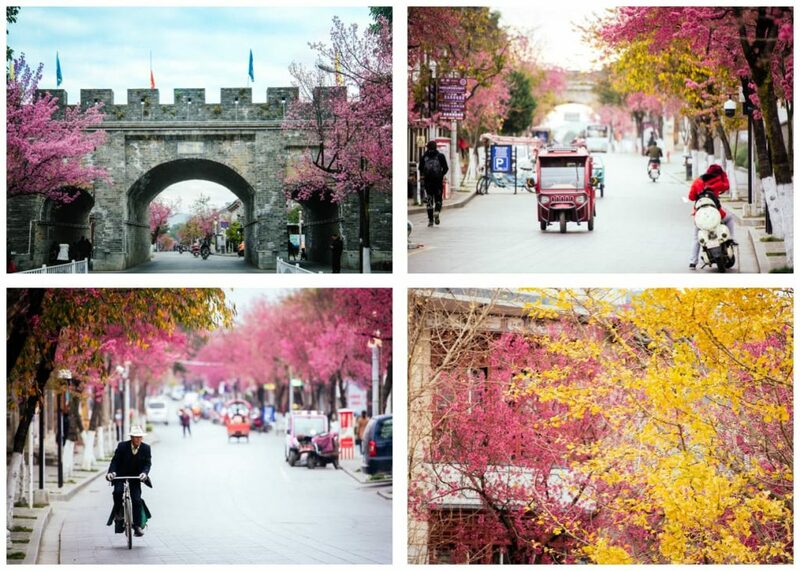 Yunnan Province is known for its flowers, and having lived here for a year, we can confirm that there are indeed blossoms of one kind or another speckling the landscape at all times. After the winter cherry blossoms fell, big white flowers started opening on other trees before the spring season. During the Summer, other varieties open up on the branches and all over the ground, and in the fall, yellow ginkgo leaves fall in the streets. But of course, cherry blossoms are just special. The sheer magnitude of the event – with whole landscapes turning solid bubble-gum-pink – transports one to a world that seems either alien or almost cartoonish; a flowering fantasy. In just over a year, we’ve seen it happen three times, and I don’t think it will ever get old. For more information on the region, check out our articles about Dali and nearby Lijiang, or just head to our destination page to see where else we’ve been. If you’d like to help support this website and our family, have a visit to our shop while you are planning your next big adventure. I really miss a link to your latest blog posts. I only found this one by mistale when googling to see if your ebook was on Amazon. I thought you had stopped blogging or something had happened since nothing from 2019 on facebook or in newsletter. Lot´s of interesting stuff to read about China on your site. I was in Dali and Lijiang in 1988 and it´s almost hard to believe it´s the same places. Wow, it feels great to hear that people notice when we aren’t around. We definitely took a long break from the blog, but we are certainly not finished with it. We have been very busy making arrangements for the next stage of our journey, but we’ll soon be posting regularly again, probably about once a week. We also have been slow about getting the Amazon version of the e-book up. We wanted to find a way to make the page layout responsive, but it might not be possible. Hopefully we’ll have something up there soon! Visiting Yunnan in 1988 must have been a real adventure. We went in 2013 and things have changed a lot since then. I can only imagine how different it was a quarter century before that. Can you tell us a little about your experience back then?